Trying to describe BBC’s The Office is a difficult affair. On the one hand, it is a cringe festival. If you’re like me, you have to turn the channel when somebody on Springer is making a fool of himself. That, or you yell out at the TV when Seinfeld’s George is about to commit his latest crime of frivolity. If either situation sounds familiar, then you will have real trouble watching David Brent in action. On the other hand, The Office is an accomplishment in terms of its realism. It is amazing how this show captures office life, office dramas and personalities. The Office is a fly-on-the-wall documentary about the Slough district office and warehouse of Wernham Hogg, a paper company. The documentary interviews manager David Brent and his staff. The show captures the day-to-day goings on in the office. This is a particularly stressful time for the staff, because Wernham Hogg has decided to close a branch, either Swindon or Slough. The surviving branch will absorb remaining staff after redundancies are cleared up. The footage also focuses on the troubled relationship/non-relationship between two Slough workers, Tim and Dawn. This DVD contains six half-hour episodes that make up the first season. The six episodes form a story arc, but each episode is special in its own way. 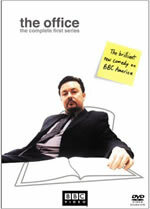 David Brent is played by Ricky Gervais, who created the series with Stephen Merchant. The duo also co-directs the shows. They employ a documentary style that is easier to produce than a more traditional sitcom, according to the extras. This documentary style also allows the producers to display prolonged, uncomfortable silences, reminiscent of the Larry Sanders show. Added to the silences, is the fact that the characters can react to the camera, to great comedic effect. The documentary style also gives the opportunity for talking head interview bits, where we can see what the characters are thinking, but might not express to their co-workers. It is always funny to see the difference between what David thinks he is, or what is going on, and the actual truth. Despite seeming so realistic, most of the show is scripted. The Office often appears ad-libbed. This is clearly the result of fantastic actors, and wonderful dialogue. The producers also removed more sitcom-ish moments from their script to keep the documentary flow. When all is said and done, the centerpiece of the whole affair is David. Basically, David sees only his ideal self in the mirror, and is anything but. David thinks he is hilarious and the greatest manager ever. He can rationalize nearly anything that may suggest the opposite. On occasion, he reacts very badly when confronted by reality. It can be quite difficult so watch David at work. This performance, though quite large at times, is also very deep and complex. David is surprisingly able to mine new depths. The fact that this guy is hard to watch at times is a sign that you are involved with the character. The video on the DVDs is in keeping with a documentary. Unlike most television programs, it is presented in 16x9 anamorphic widescreen. It is not from a high definition source, but the video is very good for what it is. Given the pseudo-documentary style, the video is quite appropriate for the material. The sound is Dolby Digital 2.0. Again, because this is supposed to be a documentary, you don’t expect 5.1 surround. Dialogue is easy to hear, which is great because of the accents and references. The music over the credits sounds fine. For extras, a documentary about the creation of the show is included on disc 2. There are interviews with the show’s creators, early versions of the material, as well as scenes from the unaired pilot, and interviews from the cast. The cast discusses the quality of the show, and the great success of the program in England. A booklet is also included to help us North Americans through the Slough slang and cultural references.